We are not new to Fish Keeping. I have had fish on and off, more on, in my lifetime since I was a child. I also had "Sea Monkeys" and followed the instructions that came with them for Training Them to do Tricks. I had them as well as my first, that was mine and mine alone, aquarium. When I won the goldfish from the Ping Pong tosses as School Fairs and Carnivals, mine lived. I had them in bowls and they lived quite some time. My husband has had fish since he was a young child too. Fish were the only animals he was allowed to keep as a young boy. He remembers his first coming from the Central Hardware Store. Their Pet Dept. was no longer but that day they had a child's swimming pool full of bags of goldfish for sale. Since then he has had fresh water aquarium in his room growing up for many years. He has also owned and maintained (some of you will know what all this takes) a salt water aquarium that included not only salt water fish, but also Sea Horses, Shrimp, Crabs, Anemones, Corral and more. So neither of us are new to keep fish, but neither of us really trained fish more then just to have them follow us or our hands around the tank. Did I research the breeds and pick the smartest? No. Did I stand and watch all the little containers of Bettas to see if any looked like they were little Einstein's? No. Did I try to get any of the fish in the little containers to see if they would follow my finger? No. I looked them over to make sure they looked healthy and alert, then..... I picked out the one that I thought was the prettiest. May not be the best way to pick out an animal, one you want to train, but that is how I did it. You would have to know my husband and I to understand. He actually thought I would have trained one sooner. When it became the rage again when the guy taught his fish and started selling Agility and Trick Equipment with Instructions. When Deron saw it all, he offered to buy me a set. Deron and I have taught ALL SORTS of animals tricks and tasks and agility. Deron has been very supportive. When I wanted to train Pet Rats to do Agility there was very little information "out there". Deron had built several pieces of Dog Agility Equipment, as well as Rabbit Agility for me, so he took out a pencil and did the math to bring the sizes down for a Rat. When I walked over to him in the store with two fish I was trying to decide between and showed them to Deron, he said, "Get both." I chose one. Since Bettas can and more are kept in smaller bowls rather then aquariums I am able to move the container that King Fredrick is in when I work with him. I move him to the same area, on the table, and then open the lid to the container. This, I believe, cues him to what is coming. Food. I also an not adding much to the container his is in. I will not have any of the cute caves or other aquarium "pretties" so that he is focused on me and what I put into his living space. When I work him I also remove the plants that are normally in the tank with him. I place them on a clean dinner plate and replace them when I am finished. I do not use clickers when I train. I don't care for them, I never have thought about using one. I won't go on and on about it, I will say, that if you need a clicker to train, use it. If you can train without one, you will have more hands to work with and in a group of trained animals the one trained without the clicker will not become confused. This page will be a work in progress. This is a place for me to keep notes (yes, I also keep them in a notebook, you never know what might happen to a webpage when you least expect it) I will try to be very clear and detailed so that it might help others in training their own fish. One thing for sure. Not only is every breed of fish different, and much the same, each individual is different, and yet much the same. That goes for trainers too. Staying consistent in your training, being kind to the fish, not expecting too much or expecting anything to come quickly will help keep fish training in perspective. One warning: Do not overfeed your fish trying to train too often or too many times a day. Not only can fish get fat, you can soil their living space and make the fish very sick. Just keep at it as you feed and be very very patient. If you have questions about your fish training you might join the list above and get answers not only from myself but others that are training or have trained fish as well. I bought a Crown Tailed Male Betta Fish. He is mostly Lilac with Pink and Turquoise and now named King Fredrick. The plan is to train him to do a trick or two as well as a bit of Agility. I took a yellow straight ink pen and took it apart. I am using the outside shaft for my target pointer. I put a piece of Betta Food into the bottom, but it fell out and it was too big for Kin Fredrick's little bitty mouth. So I reached for the flake food, broke off a small piece and held the pen shaft right next to it. King Fredrick came and took the food. When fed, King Fredrick the Betta Fish, came right up and took the food from beside the pen shaft. After I had put him away I relized I should get a photo. So I got him down and took a few. I was in a hurry when I trained King Fredrick. I used the pen shaft and he came RIGHT to it and when I moved the pen shaft to the other side of the bowl, he followed it. I think he really is catching on. Today King Fredrick came to the pen shaft, followed it to the other side of the bowl, then passed floating food and touched the pen shaft's end. Time to make and think about props for training. Sure enough King Fredrick IS ready for props. 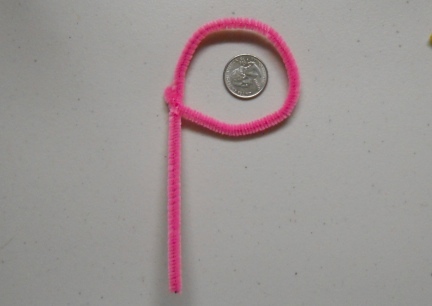 This evening at feeding time I took a bright pink pipe cleaner and bent one end into a larger then what I plan to eventually use hoop. I had Deron, my husband, hold the tail of the hoop with the hoop or rounded end into the water for King Fredrick. I held the pen shaft and food at the other side......sure enough, he came through. Then we repeated....and so did he! The idea is to make the ring smaller as I work with him. How large of a hoop? A large hoop, like a child's hula hoop for a Cocker Spaniel......but still, he did go through it twice, and that IS how animals learn. Set them up for success. SUCCESS! I set the hoop into the middle of the bowl. King Fredrick was on one side and I added a flake of food and set the pen shaft....almost down, when he came through the hoop and took the food. The next three times he came through I had the pen shaft just above the food. Then I gave him a bit more food, three little pieces <read tiny> and held the pen shaft over each. He ate the ones by the pen shaft as I held it. I really believe he has caught onto that the pen shaft means food. Today was a repeat of yesterday, meaning it went very well. I will continue to be repetitive with his training. 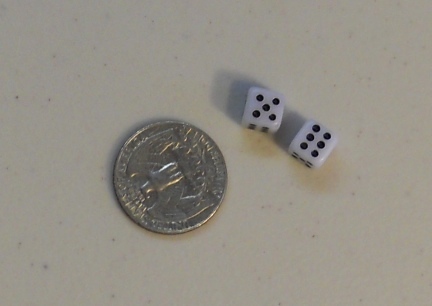 I did buy a new prop for him today, a set of little dice. 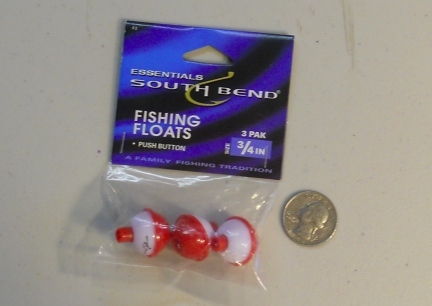 They will be perfect for bottom tank/bowl games as they are sinkers. A few years ago Deron was sure I would start training a Goldfish I had. He offered to buy training items and the website www.FishAgility.com Well, today, as a surprise, he bought the Domain Name for me. All of my life I have tried to encourage others to tame, train, work with, and form a bond with their own animals/pets. I think it is important for the animals and the humans. So I have several websites with information from my own experiences on how to train their pets. I took the size down on the Hoop before training tonight. I made two mistakes. One, the piece of flaked food I used, I did not break down far enough. It was too large and it fell to the bottom of the bowl. Two, I did not catch the flaked food when it fell. King Fredrick did come through the hoop, but he also hesitated....was it because of the size of the food, or the food falling so quickly, or was it the size of the hoop? Don't Know. I hate when I make mistakes when training. When I make mistakes I can not be sure why the animal acted as it did. When I make mistakes it can and often does set my training back a step or two. Hopefully tomorrow will go well. Today I made a "tunnel" for King Fredrick. Deron, my husband, and I have trained all sorts of animals to enjoy an Agility Course, Dogs, Goats, Guinea Pigs, Pet Fancy Rats, Mice, Hamsters, Gerbils, a Goose.... and we have made the Agility Equipment we used for them. So of course we would make King Fredrick's also. 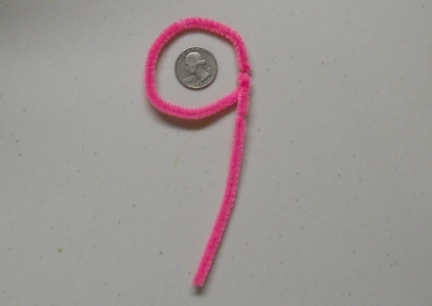 When I finished it I thought, Man, it looks like a 1960 Hair Curler on a string. If you look closely at the photo you can see the holding string on the top of the Tunnel. Well I will be darned! This morning I put the Tunnel into the water and held the yellow pen shaft on the far side of it. It took a few seconds, but King Fredrick came through the Tunnel! 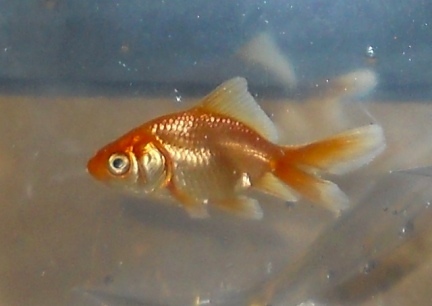 I was going to buy a Guppy, but they did not have any, so, this afternoon I bought a Fantail Goldfish. I also bought a new Kritter Keeper. Deron has had all types of fish, salt and fresh water, large and small, and he has some wonderful ideas on how to filter and airate the Kritter Keepers and I would still be able to unhook them and get them down on the table or training. I am excited about that. We named the Goldfish Blitzen. Yes, Blitzen, like the Reindeer. Why? Well, there is a pretty famous Agility and Trick Goldfish named Comet, yes, I know it was named for the breed that it is/was. When Deron and I raced sled dogs we knew people that would name their dogs after Santa's Reindeer....so we thought Blitzen for a Goldfish worked for us. This evening I took a Blue stick ballpoint pen apart and will use the shaft for Blitzen the way I have for King Fredrick. I set it in the Keeper with Blitzen and waited. Blitzen was pretty scared. We did just get home after a 51 mile trip to the gate then 6.4 miles of bumpy dirt road (I held the bag like a horse class egg and spoon). Deron was moving around and well. After a bit the flake started to sink and Blitzen grabbed it. So I put another in and set the blue pen shaft right by it. As Blitzen finally came to get it, it started to fall too. I will keep working with Blitzen just as I did King Fredrick and see how it goes. King Fredrick it was almost too easy. I put the Tunnel in and held the yellow pen shaft into the water with a food flake on the other side of the Tunnel....and it only took him a second or two and he came through it. Blitzen On Blitzen's behalf, he has a larger area. (He? I have no idea really, but need to call it something). It took a while for him to come and get the flake from beside the blue pen shaft. Then I did a second flake, that too took some time. But, he did come and get both. Today we went to Rapid City and bought some aquarium parts that Deron will hook up the the Kritter Keepers so that they are airated and filtered when I am not working with the fish on the "training" table. I also bought a female (they were out of male) Guppy. We are thinking of naming her Guinevere. I want to work with the three different breeds of fish just for the fun of it. The pet store had Clown Fish (salt water) on sale...very tempting. Just not enough room in our home right now for a bigger tank. We bought a different keeper for King Fredrick so that Deron can set them up with aeration and filtration and I can still get the keepers down easily for training. I thought it might distrupt training, but King Fredrick came right through the hoop. No hesitation at all. Blitzen, the goldfish, came up to the blue pen shaft for food. Pretty quickly and not without reservation. But came all the same. I will need to take another colored pen apart and start training the new Guppy, named Guinevere to use for training her. I am very pleased with Blitzen today! Blitzen came right up to get his food. I am going to make him a pipe cleaner Hoop for tomorrows feeding. Guinevere came right up to the food with her new red pen shaft above it. She was reluctant, but came right away. Hopefully, her training will go well with her. All three fish did very well this evening. King Fredrick The Betta swam through the Tunnel twice. Blitzen the Goldfish swam through the new green pipe cleaner hoop three times. Twice, then Deron came in just as I finished, so I HAD to show him. Guinevere the Guppy also came through the red pipe cleaner hoop, and that, on her second day here. Deron also finished putting together and I uploaded the training video of King Fredrick The Betta swimming through the Tunnel this morning. Today I did something a bit different. Rather then holding the pen shaft over the food, I used it as more of a target. I had Guinevere and Blitzen touch the pen then I dropped a food flake right there. It went well. I had Blitzen swim through the red hoop. I used the Betta Food Wand for King Fredrick. The first two times he came to get the food he could not get it out of the holder, but on the third try he did. I tried it again, but he was uninterested. 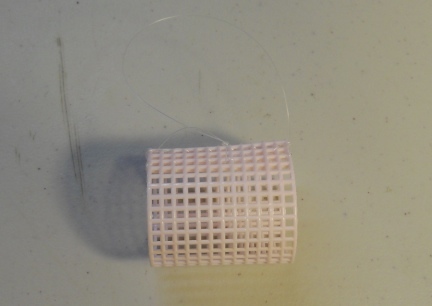 However, when I took the piece out of the holder and dropped in into the keeper, he grabbed it. Have you ever given something a ride in your cart at Walmart thinking about buying it? Like maybe it was the last one, or you have not decided, or you want to see how much other money you spend???? Seeing the look on my friend Nichole's face when she reads this <well thinking about how it might look and hearing the laughter> PRICELESS! I did not train today, so much to do when we got home from town and it was getting late. I will get photos of our new fish up very soon. He really is a beautiful thing! We took the living room apart, or at least it seems like it, to hang another shelf for the fish keepers. We set up the new Red Crown Tail Betta, Erick the Red Betta. Today was a good fish training day. King Fredrick the Betta followed the pen shaft from one end of the keeper to the other. Guinevere, the Guppy, came right to the pen shaft and touched it. Blitzen, the goldfish, SWAM THROUGH THE HOOP FOR THE FIRST TIME! He was a little bit confused, it took a minute, but he followed the pen shaft and came right through. I am so tickled! Erick the Red Betta was a bit afraid when I fed him today. I do not have a pen shaft for him yet...later today. And I will be making him a Hoop also. Tonight Deron started setting up the fish keepers with filters and bubblers and all. Erick the Red Betta is all set up. It took a bit more work/parts then planned, but it sounds like we own an aquarium in here. Deron has all four keepers hooked to one pump, but no common water is shared. When he was looking at setting this all up and buying parts I said I would have three keepers. He said "I will set up for four and it looks like I'll be able to add on." Then when I got the shelf ready for the keepers and set them up there side by side (goldfish between bettas) he said "Looks like we could set five up there with no problems and six if I........." <grin> The plan is to just have the three, well, then I found Erick the Red Betta, so four. Just four. Training went well. I just train for that short time it takes to feed. Erick the Red Betta had trouble getting the betta food out of the holder. But he did keep trying....good and did get it after three tries. Guinevere, the Guppy, I am starting to think is the smartest of them all. I put the Hoop into the water and before I could do anything else, she came through, then came up to the surface for food. Blitzen the goldfish, did very well with the Hoop, and King Fredrick the Betta was a little "off" today, but did well all the same. This morning when we got up and turned on the generator, it sounded like an aquarium was peculating. It has been a while since I have had that and Deron and I have not yet shared an aquarium. Today even I can not believe how well King Fredrick the Betta did when training him. 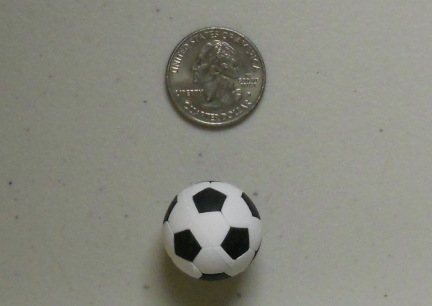 At fist I put the soccer ball down in his tank. I held the pen shaft end down in the keeper right over the ball. King Fredrick kept coming the the middle of the shaft at the waters edge. So I took the end and moved it past King Fredrick then around the keeper and down to the ball. He followed. I will be doing routine training with the other fish. I will probably no longer keep a daily note, unless something bigger happens, not the same day to day.